One point of evidence in support of dark matter is the way in which the speed of stars, gas and dust in a galaxy varies with their distance from the center of the galaxy, known as the galactic rotation curve. Most of the visible matter of a galaxy is concentrated near the center of a galaxy, so we would expect that more central stars should move much faster than stars on the outer rim. Thus the rotation curve should decrease with distance. However most galaxies have a fairly flat rotation curve, meaning outer stars move about as fast as inner stars. This and other evidence as led us to develop the theory of dark matter. But new research on galactic rotation curves has found an odd correlation, and it could mean that dark matter is wrong after all. 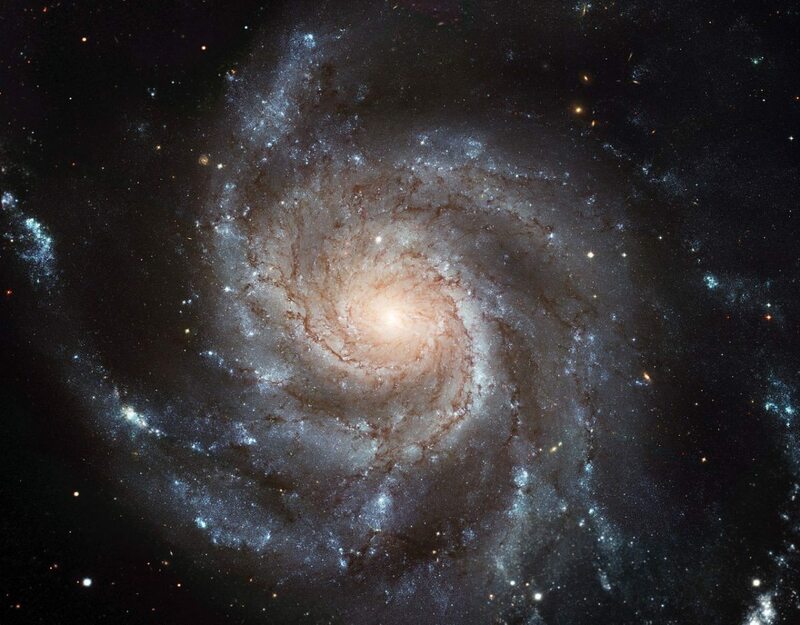 The orbital speed of stars in a galaxy depends upon the gravitational pull of a galaxies mass. The more strongly a star is pulled toward galactic center, the greater its radial acceleration, and the faster it needs to move to overcome that pull. This is similar to the planets in our solar system. Mercury is close to the Sun, and therefore has a large radial acceleration due to the Sun’s gravity. Distant Pluto has only a small radial acceleration. So Mercury zips around the Sun at 48 km/s, while Pluto chugs along at less than 5 km/s. According to the dark matter model, a galaxy’s mass isn’t concentrated in its center. Most of the visible matter is, but a galaxy is surrounded by a halo of dark matter. Most of a galaxy’s mass is dark matter, and most of it is in the halo. There’s a lot of other evidence to support dark matter, but there have also been alternative models such as Modified Newtonian Dynamics (MoND). In this model, the radial acceleration of a star deviates very slightly from that predicted by Newtonian physics and general relativity. The difference is too small to notice on the scale of our solar system, but on a galactic scale that difference adds up, producing a galactic rotation curve just as we observe. MoND and related theories can accurately describe rotation curves, but they fail to describe other effects such as large scale galactic clustering and the mass distributions of colliding galaxies, so dark matter is the dominant model in astrophysics. But new research on the radial acceleration of stars could bring MoND back into favor. The correlation between radial and gravitational accelerations is pretty strong. Credit: McGaugh, et al. 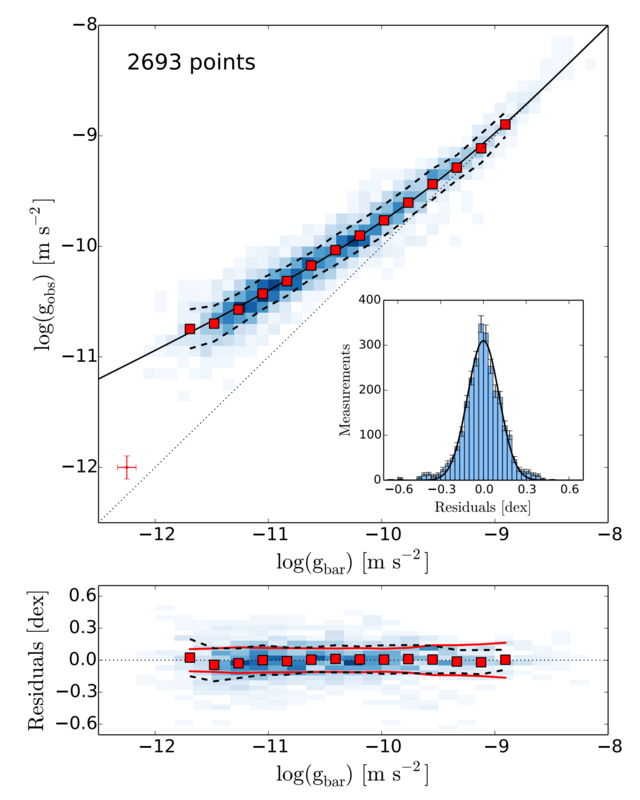 The researchers looked at the observed rotation curves for 153 galaxies, and calculated the radial acceleration at various distances in each galaxy. They then compared these results to the gravitational acceleration as predicted by the distribution of visible matter within a galaxy (technically the distribution of baryonic mass). They found a strong correlation between the two. When the gravitational acceleration was stronger, so was the radial acceleration, and when one was weaker, so was the other. What’s interesting is that this relation holds up in a range of galaxies. It didn’t matter whether most of the visible matter was clustered in the center or not, the relation still held. It’s also a purely empirical correlation, so there is no strong theoretical component to make it work. So what gives? The researchers propose three possibilities. The first is that the correlation could be due to the dynamics of galaxy formation. It’s not clear how this would occur, but there are aspects of galactic evolution we don’t fully understand. The second is that the distribution of dark matter and baryonic matter within a galaxy are correlated. This would require some new kind of dark matter physics that makes dark matter clump in the same way that regular matter does. The third and perhaps most intriguing idea is that it really is due to some kind of modified dynamics. The correlation between radial acceleration and mass distribution is strong enough that it points to baryonic matter being the source of the acceleration. A relation such as this is exactly the kind of thing MoND models would predict, and it contradicts current dark matter models. If this result is replicated, dark matter will have some explaining to do if it wants to remain the dominant theory. But the challenge for MoND is also just beginning. To succeed in the end it will have to account for things like large scale clustering, where it currently fails miserably. The game between dark matter and MoND just got a bit more interesting. So what is this “large scale clustering” which MoND struggles to explain but that dark matter explains well? A couple of things, Brian. First, thanks for not being reflexively dogmatic in the face of unexpected data. It is refreshing to see you consider the possibility that DM is incorrect. Sometimes we non-experts get the feeling that scientists are not as open-minded. Secondly, thanks for making me break out my old college physics text to start better educating myself on the result of this paper. As a mechanical engineer and total cosmological layman, I am looking forward to posing some questions that are hopefully not too stupid. I’m always amazed how common the stereotype of the dogmatic scientist is, given that deep down most scientists would love to see an entrenched theory be overturned. We’ll always push back against wild, unsubstantiated claims, but in the end we are driven to follow the evidence. My behavior is much more the norm than the exception. I don’t understand the difference between radial acceleration and gravitational acceleration, except that the latter is also called mass. But I thought the baryonic mass didn’t explain the rotation curve of the galaxies. Radial acceleration is simply the centripetal acceleration needed to keep a star in galactic orbit. Literally v2/r. Gravitational acceleration is the acceleration due to baryonic mass. Baryonic mass doesn’t account for all of a star’s radial acceleration, but there’s a correlation between the two. Thans for the post, Brian. I echo EricG’s appreciation for your openness. In the same spirit, I think you should consider Mike McCulloch’s MiHsC (Modified inertia Hubble scale Casimir) hypothesis. It doesn’t do arbitrary parameter fitting, as I understan that MoNd does. McCulloch has a post that specifically addresses the McGaugh et. al. results, at physicsfromtheedge.blogspot.ca/2016/09/mihscqi-vs-new-mcgaugh-lelli-data.html . It’s worth a read IMO. Is there anything in (on?) arXiv which presents this idea? In a relevant, peer-reviewed journal? If not, why not? There was recently (here?) reports of discoveries of galaxies with a very high ratio of dark matter to visible matter. (Few visible stars but orbital velocities very high indicating lots of dark matter inward of those stars) How do those fit in with the above? This particular study doesn’t look at them. Given that dark matter galaxies are only recently being studied, that’s not surprising. You emphasize a new theory of gravity as a solution, but given all the tests of relativity vs. competing theories, is not a more plausible explanation rather that the distribution of dark matter and baryonic matter within a galaxy are correlated? Reading between the lines I infer that you view the latter theory as less plausible. If so why? I don’t think it’s less plausible. Given how little we know about the mechanics of dark matter, it’s quite possible. My point was that the most popular versions of dark matter (with little or no self-interaction) would need to be modified to include some kind of interaction in order to account for this effect. Dark matter and dark energy have to exist if the speed of light is a constant. Even though the most distant galaxy’s prove there is an upward tick in the velocity. So its not. We will be apologising to Fred Hoyle at this rate. No, the speed of light is constant, and has been constant for at least billions of years. We know this experimentally. So could the recently discovered dark matter galaxies possibly fit on the regression line on the diagram above, or would they necessarily be well away from that line as they (as I understand it) have a high ratio of radial acceleration to the gravitational acceleration predicted from the observable baryonic mass? Dark Matter and Dark Energy is Gas. Maybe there’s more than one phenomena going on here. One inside of galaxies and another that forms those interclustular filaments and Bullet Galaxies. If dark matter clings to ordinary matter, couldn’t it be that this kind of dark matter forms the correspondence of molecules and planets, but all dark to our electromagnetivity? Maybe there’s dark life around here, of which we can only notice the mass. Matter without properties, like a black hole. I would really like to see a comprehensive analysis of each theory’s pros and cons: DM, MoND (and variants), and MiHsC, as well as any others that I’ve not heard of yet. I’ll settle for a non comprehensive listing of problems by commenters here. Even just a few to set me thinking would be nice! I’m looking for assertions of the form “theory X violates principle Y”. E.g., the equivalence principle (which formulation? be specific), conservation of momentum, conservation of energy (though it’s difficult to speak of conservation of energy in an open/infinite universe), and so on. A bit of explanation to go with the assertion would be nice; explanation plus math wood be even better. Statements of the form “theory X doesn’t explain phenomenon Z” are interesting, but perhaps less so than more categorical “theory X violates principle Y” statements. After all, with more study one might see that theory X does explain phenomenon Z, or that we didn’t quite understand that phenomenon, but violations of widely accepted principles require more effort to overcome and might even require modifying the violated principle in order to survive, which would be a tall order indeed (though maybe not insurmountable). I’m NOT looking for statements of the form “theory X explains …”. We already get such statements from the theories’ proponents. I’m also not really looking for objections like ” theory X is unscientific”, or ” theory Y requires fitting N parameters to data”, though these and generally statements about the degree of freedom in a theory are very useful indeed. Such features are easy enough to notice and not necessarily fatal early on. We must take notice of these, but I’m already aware of some of them, so they don’t help _me_. I’m especially NOT looking for ad hominems of any kind, nor pointers to objectionable behavior of proponents. Basically I’m looking for a filter and/or challenges that make one think things through more carefully before spending much effort on any I’ve theory. I do realize that study of DM gets a lot of funding, which might tend to skew some of the answers i might get, but that’s ok. Statements of the form “i’ve not yet found our developed an objection to their X, but have tried” are useful. Explanations of what principles you think are not violated by theory X and why are very nuch welcomed. Depends on what you mean by “principle”, but MOND violates relativity. However there are several ideas which do not violate relativity and which ‘reduce to’ MOND in the appropriate limit. For example, TeVeS. How? I’m not sure how to answer that, except perhaps to say that MOND is Newtonian, so whatever it is in Newtonian physics that violates relativity, MOND has the same violation(s). Just read the paper. This is a rather elegant challenge to the idea of dark matter. In light of all that, imagine a thought experiment where there is a black hole with an accretion disk consisting entirely of dark matter. What would it, ah, “look” like? Would there be anything expelled in jets perpendicular to the accretion disk? We have a bit of a problem here because the idea of black holes was derived entirely from the properties of baryonic matter. Dark matter only interacts with visible matter through gravity and the weak nuclear force but not the electromagnetic and strong nuclear forces. Since visible matter interacts through forces that do not interact with dark matter why is it assumed that dark matter does not posses interactive forces that visible matter does not interact with? Whilst this proposal might founder upon Occam’s razor it would give the whole thing a pleasing symmetry that is often observed in physics and mathematics. Moreover, if we are going to wield Occam’s razor why indeed not go the whole hog and prefer Modified Newtonian Mechanics which, with some extension, would eliminate the need for dark matter altogether. Further, if dark matter does posses such forces then it may well clump and as it can interact with visible matter through gravity the two might well be expected to clump in broadly similar places. Finally, to obtain halos of dark matter around galaxies its dominant interaction on that scale which does not interact with visible matter could simply be repulsive. Don’t think so; for black holes, mass is mass is mass. The only exception that I’m aware of is electric charge. It’s only been on arXiv a few days, and already there are several newer preprints discussing (etc) it! In Bee’s Backreaction blog there’s a post on it, and some comments from at least one author of one of those. Interesting and exciting blog by Brain, on a really cool topic! is it too silly to suggest that since the universe is expanding so may the galaxies be, though not at the same rate? Simplistically, I wonder what the tangential accelerations would have to be to explain the differences between rotational acceleration and gravity?